Deborah Tannen is University Professor and Professor of Linguistics at Georgetown University. She has published over 20 books, including You Were Always Mom’s Favorite! (2009), Talking Voices (2nd edition, 2007), Conversational Style (2005), and You Just Don’t Understand (1990). She has been McGraw Distinguished Lecturer at Princeton University as well as a fellow at the Center for Advanced Study in the Behavioral Sciences at Stanford. Heidi E. Hamilton is Professor and Chair in the Department of Linguistics at Georgetown University. Her publications include the Routledge Handbook of Language and Health Communication (co-edited with Sylvia Chou, 2014), Linguistics, Language, and the Professions (co-edited with James E. Alatis and Ai-hui Tan, 2002), and Conversations with an Alzheimer’s Patient: An Interactional Sociolinguistic Study (1994, 2005). Deborah Schiffrin is Professor of Linguistics at Georgetown University. Her publications include In other words: Variation in reference and narrative (2006), Approaches to Discourse (1994), and Discourse Markers (1987). She is also the co-editor of Telling Stories (with Anna De Fina and Anastasia Nylund, 2010) and Discourse and Identity (with Anna De Fina and Michael Bamberg, 2006). 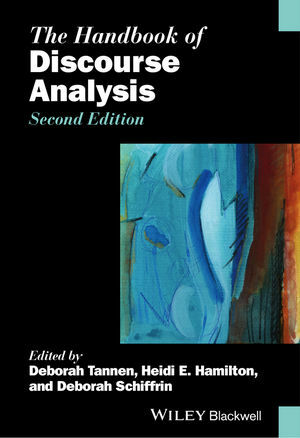 ‘The 2nd edition of The Handbook of Discourse Analysis boasts chapters by major figures (e.g. Gumperz, Holmes, Johnstone, Labov, Lakoff, Schegloff, Ochs, Shuy, Tannen, van Dijk, Wodak) and its reconfiguration of chapters captures important scholarly trends in discourse analytic research and reflects a fairly substantive reconceptualization of the field.’ (Susan Ehrlich, Journal of Sociolinguistics 20/2, 2016).